It is bitterly cold this weekend in Michigan, temperature around 10 degrees with a wind chill about -15. However they are doing well, going out to the food and water. What has worked for me these last two winters is to cover the sides of the coop and leave the door open. This year they got an upgrade with some blue tarps from Harbor Freight. The other advantage they have is this location is on the lee side of a drop in elevation. That is this is where the property drops down into the river bottom land so with the trees also in this area tends to be sheltered. 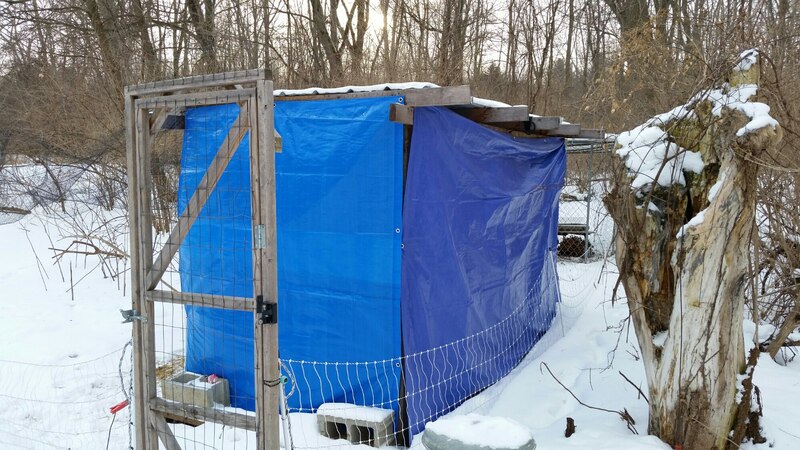 This entry was posted in chickens and tagged Backyard Chickens, chicken coop, chickens. Bookmark the permalink.